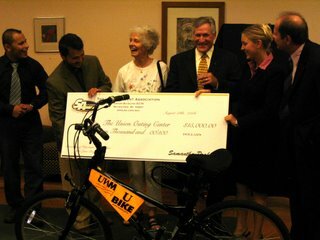 A $15,000 donation from the University of Wisconsin-Milwaukee Student Association enabled the Union Outing Center to purchase 50 brand new bicycles for its U-Bike program, where students utilize the bikes throughout the school year.The proposal came from last year's SA president Russ Rueden and was fully realized under current president Samantha Prahl. UWM Chancellor Carlos Santiago, Union Director Scott Gore, Union Outing Center representative Gary Miller and Third District Ald. Michael D'Amato remarked on the importance of the U-Bike program. "It shows what we can do between our campus, community, student representatives, and individuals prompting environmentally friendly alternatives to travel to campus," Santiago said. Ultimately, he said, UWM is attempting to find student and community friendly ways to manage the university’s growth growth. D'Amato said alternative methods of transportation to UWM make it easier on students, the environment and current infrastructure. "The students really put the money where their mouths are," D'Amato said. "What a great thing--for students to use their own money to find a solution." The new bikes bring the total number of bikes in the program to 100, Miller said. The bikes will be distributed from Sept. 11 through 15 from the Outing Center.